Waking up Itchy? Could It Be Bed Bugs? - Yes Pest Pros, Inc. Waking up Itchy? Could It Be Bed Bugs? - Yes Pest Pros, Inc.
Waking up Itchy? Could It Be Bed Bugs? Seems bed bugs have been all over the news lately. But how do you know if they are all over your home? What are the signs that bed bugs are lurking? Before taking any action, get the facts. Truth is that bed bugs can inhabit surfaces from your bed to your sofa to your baseboards, carpet and furniture. They can appear in even the swankiest of hotels or amidst clutter in a typical home. They look like little brown dots on a mattress. They come out at night when you least expect it and bite. If you’re waking up with itchy, red, bruised looking skin, it could be a bed bug infestation. Once you’ve got bed bug problems, they’re not going to go away on their own. 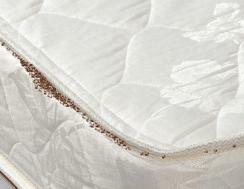 The female bed bug can lay five eggs a day. And in her lifetime, she can deposit over 500 eggs in your home. And that’s just one bug! They’ll shed their skin five times before becoming full sized, so you may see their discarded casings on a mattress. They can’t jump or fly, but once you’ve got them, they’re not going away by themselves. Calling in an bed bug exterminator is the only way to remove them fully. If you’re looking for Bloomington pest control or Elkhart pest control services, you’re in luck. Young Environmental Solutions homes and businesses in the entire area with a chemical free bed bug treatment. It’s completely safe and harmless to humans. And it kills bed bugs dead. There’s no need to evacuate the area and you can return to daily activities the same day. Don’t waste money on sprays or other chemicals that don’t work. Call in experts – Young Environmental Solutions.